“Even if you’re already a seasoned Drupal user of CCK, Views, or Panels, I’ve no doubt that this book will provide you with several new techniques and methods for getting the most out of these extremely essential modules. It certainly has for me.” —Dries Buytaert, founder and project lead of Drupal, and CTO of Acquia With Drupal, Web professionals can create full-featured Web sites with just a few clicks. Drupal’s core is compact and well documented, but much of Drupal’s immense power lies elsewhere—in external modules. 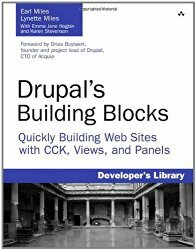 Drupal’s Building Blocks is an authoritative tutorial, reference, and cookbook for Drupal’s most valuable modules. The authors are Drupal insiders who’ve spent years creating and supporting these modules—Earl Miles, developer of the Views and Panels modules, and Lynette Miles, Drupal documentation team member. They’ve brought together indispensable information you won’t find anywhere else, as well as extensive sample “recipe” code designed for easy adaptation and reuse. Learn how to Use Content Construction Kit (CCK) to customize your data input forms around your needs Improve site flexibility with Drupal’s node system Add optional field types, including PHP-based fields Customize themes to display data more attractively and legibly Build powerful Views query displays Integrate with SQL databases Customize Views with relationships, arguments, and filters Optimize query performance Add custom styles with the Panels module Maintain full control over sites as you deploy into production This book will help you create more powerful, flexible, usable, and manageable Web sites—whether you’re a Web developer, designer, administrator, architect, or consultant. The accompanying Web site contains all examples, code, and themes presented in this book.